The Light Company 86th (Royal County Down) storm the walls of Jhansi. Having defeated the rebels at Chanderi, the Central India Field Force of some 4,500 men marched to Jhansi, a fortress which was one of the largest in Central India. The leading elements arrived on 21 March 1858 and promptly engaged and killed 100 armed rebels who were attempting to aid those inside the fortress. The defenders consisted of about 13,000 troops and 40 guns. 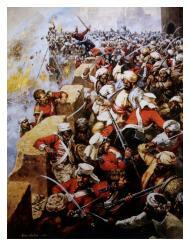 Siege operations began on 28 March and within two days the British had breached the 16 to 20 foot-thick walls. On the morning of the 30 March, General Rose heard that the rebel leader Tantia Topi, with a force of 20,000 men and 28 guns, was fast approaching to raise the siege of Jhansi. The British commander rapidly redeployed his force and in the ensuing battle, in which the 86th (Royal County Down) Regiment of Foot played a prominent role, defeated the enemy. Delayed by only 48 hours, Rose returned his attentions to seizing Jhansi. On the morning of the 3 April, Major Stuart and the Light Company of the 86th scaled the city wall under fire, while the remainder of the Royal County Down assaulted the breach in the walls. The British soon established a foothold and promptly expanded it. The enemy meantime fought with savage desperation but, gradually recognising defeat as a probable result, withdrew on 4 April from the town. In follow-up operations the British engaged many more rebels who suffered some 5,000 casualties. The 86th lost one officer and twelve men killed and six officers and sixty men wounded. Although The Royal County Down Regiment did not gain a Battle Honour for their part in the siege, they did receive four Victoria Crosses.